Looking for a fancy resort with nice and calm beach?? 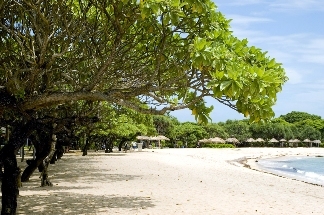 Nusa Dua is the place. The beach is a perfect location to experience the luxury vacation in Bali, with white sandy beaches and calm seawater with no hassle and little crowd. This is the location of huge and International 5 star hotels. Hotels range from nice to world class. Don’t expect a budget hotel here. They aren’t !!! There are far more expensive than Kuta. The place is very popular for Grande hotels and the romantic (???) gateway to Bali. Interested to plan your wedding in Bali?? then is this the perfect place to do with clean beach and luxury 5 star resort, your wedding won’t be stuck and you get the most romantic wedding ever. If your budget allowed it, this is the best place to stay, but the area is still a bit far from centre of Bali. But the location is easy to reach from Kuta, about 40 minutes drive. The resort is the most expensive place in Bali, there are no other places in this island of God that’s so expensive at this place. Especially if you do some diner in the hotel, the price is incredible high compare to the restaurants around Bali. The water is clear but not too great for surfing. If you want the clear blue water with great and strong waves, go to Dreamland beach, the new Kuta beach, said people. There are a lot more fun for surfer. This is more the place for family with children, not too crowded and nice calm seawater, although some of the spots could be dangerous that can pull you to the ocean, just be careful. After all, the sea is always unpredictable, just take the precautionary action, you will be just fine. Anyway I would say that this place is nice but too expensive, don’t forget to explore Bali if you’re in Nusa Dua. It's so easy to forgot everything because of the comfort and the elegancy of the hotels, you don’t want to go anywhere else. Swimming in a luxury is so easy. Don't go to this resort if you’re young and single, this is not the place for you especially if you like night party and some crowd. Then Kuta is the right place for you.